When you click on one of the specific types, that type of Action element displays on diagram. If you click on the Other option, the New Action dialog displays. You can again select to create a normal (Atomic) Action element, a CallOperation or a CallBehavior, or you can select the Other radio button and click on the drop-down arrow in the blank field to select the Action type from an extensive list. If you later decide that the Action type is not appropriate, you can change it by right-clicking on the Action and selecting the Properties context menu option, and then selecting the Advanced page of the Properties dialog. 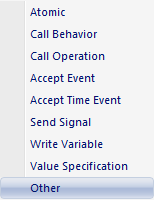 Set the Action type by selecting a value from the Kind drop-down list. For a Value Specification Action, you also set the value on this page. For a SendSignal or BroadcastSignal Action element, you can model the signal to be sent and the associated arguments to be conveyed, using the Signal tab of the element Properties dialog. These actions can take Ports, Parts or Attributes as the target structural feature.